Blue Angel Pet Salon and Boarding was started to give people a place to bring their pets for grooming and boarding without reluctance. As pet owners, we visited groomers and kennels around the area to distinguish exactly what we wanted in a kennel and grooming shop. We are more focused on pet-comfort than making a quick buck. With a combined total of over 200 years of experience, our groomers are well-qualified to bring you the best look for your pet, as well as the best experience for you both. 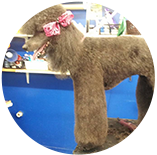 We have 6 groomers with over 25 years of experience, and two of them have over 35 years of experience. 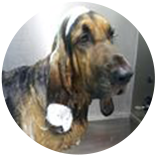 We have a reputation to uphold, and that has allowed us to be the only grooming shop in the Pensacola area to have more than one location. In fact, we have 3 locations with 11 groomers on staff to better serve you and your furry friend. Our salons are cage-free with a strict no-force policy. We also order only the finest all-natural products to ensure the safety and comfort of your pet, as well as an excellent coat so they can look their best. When dropping off, you have the ability to speak directly to the groomer who will treat your pet. 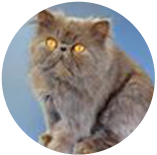 All locations offer dog grooming, as well as cat grooming. We offer boarding at our Dog Track Rd and Palafox locations. Our boarding is also cage-free. 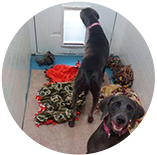 Every kennel is spacious, and each dog gets plenty of outside time to play. Our Dog Track location has unique kennels with an outside run available for each room at no additional cost. Our boarding is open 7 days a week for pickup and drop off. We have the same person working the kennels, so your pet can get comfortable and form a bond with one person rather than seeing a strange face every morning. Founded by an American Veteran, we honor all of our active military and veterans with a 10% discount every day, as well as a 10% senior discount. We know that money is no object when it comes to caring for your friend, so we try to make it affordable so your pet can get the proper care they need for the best price in town. 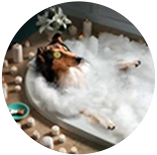 We also offer a 25% discount for first-time grooming customers. We guarantee 100% satisfaction every time. If you are not satisfied, you are always encouraged to speak directly to the owner and he will make it right to the best of his ability. We try to post pictures of all of beautiful pets when they are finished, but sometimes we just can’t get them all posted for you to see, but we are playing around with some pictures and slide shows now so we decided to post a short little slide show here for you to see. If you think about it, please take pictures of your happy dogs and cats and email them to us as PensacolaDogGroomers@gmail.com and maybe your pet will end up as a star in one of our upcoming shows !!! New groomer is amazing Buisness is new and continually growing!!! Great staff and great job on all breeds!!!! 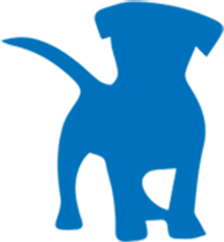 Just tried out this company. My dog was watched by their boarding services for over 7 days and nights. I picked my baby up today and he was in great condition, he was happy, he was healthy and well he looked like he had been home with his family and not stressed out in a kennel. VERY HAPPY. I also had him cleaned, hair cut, and nails cut….. he looks wonderful. No problems at all, matter of fact he has an awesome Mohawk that fits his personality to a T. I can not explain with words how happy I am, I was a stressed out mommy and my dog looks and acts like he has been on vacation, not stressed at all. Recommend highly. 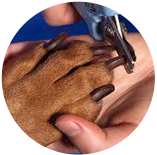 I haven’t used their boarding services before but I do take my dog in for nail trimmings. The staff has always been very friendly! They are gentle with the dogs and have great prices!